This tasty and fresh pasta dish with kale and a lemon-accented ricotta cheese sauce is ideal for summer dining. It is also one of the quickest and easiest pasta recipes you’ll ever make! 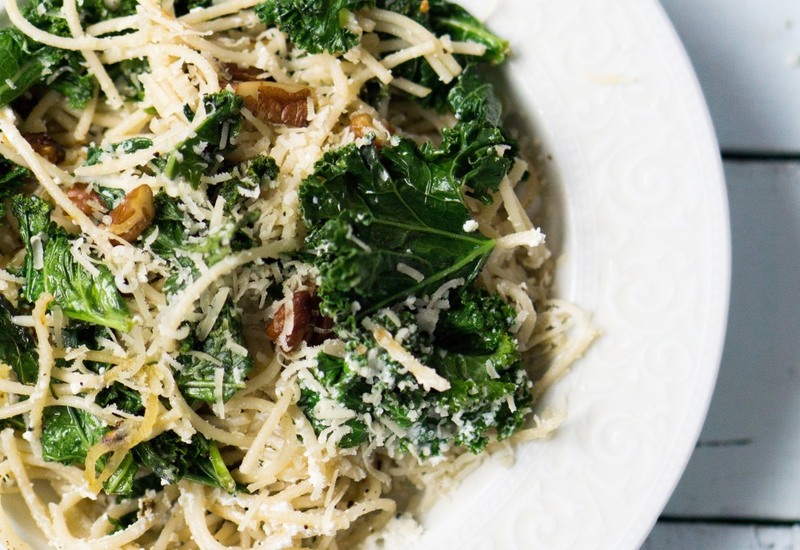 Ricotta cheese is combined with parsley, lemon zest, and seasoned with salt and pepper, while kale is wilted in a pan with garlic and chopped pecans for crunch. Everything is combined with spaghetti and topped with freshly grated Parmesan cheese. While spaghetti is the suggested pasta here, your favorite noodle will do. You can even go gluten-free with brown rice pasta. It will likely hold together best when cooked al dente. Try thinly sliced Swiss chard or spinach instead of kale. Top the dish with ribbons of basil for a fresh flavor. A nice crisp white wine, like Vinho Verde or Sauvignon Blanc, would go nicely with this dish. Per Serving: 487 calories; 31g fat; 41.9g carbohydrates; 13g protein; 12mg cholesterol; 406mg sodium. By right of living in the Pacific Northwest, I'm required to eat a LOT of kale. I'm also meant to enjoy it every time. Not difficult here. Ricotta, garlic, and lemon can make just about anything pretty palatable, but the fact is that I DO like kale! Going to spiralize some zucchini and use it in place of the spaghetti next time. After trying this dish I think I am forever in love with ricotta cheese sauce. The garlicky kale is also amazing. Perfect pasta dish, and pairs perfectly with whole wheat pasta. I used brown rice pasta and skipped the pecans. The ricotta lemon cheese sauce was fanatic. I added a little lemon juice in addition to the lemon zest. Gluten free brown rice penne was the perfect substitution for this dish. I used walnuts instead of pecans, and added leftover shredded rotisserie chicken. Perfect weeknight meal. Swapped kale for spinach and added extra ricotta. This dish was extra creamy and delicious. I also used walnuts instead of pecans.